Back row: Billy Dunlop, Archie Goldie, Harry Storer, Matt McQueen, General Stevenson, Tom Wilkie. 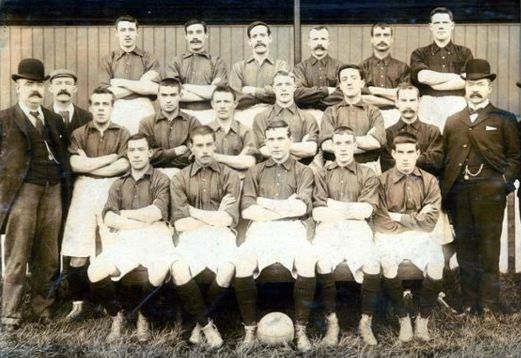 Middle row: Tom Watson (Secretary-manager), J. Chapman (Trainer), Andrew McCowie, William Goldie, Raby Howell, Alex Raisbeck, Charlie Wilson, Thomas Cleghorn, John McKenna (Director). Front row: Bobby Marshall, John Walker, George Allan, Hugh Morgan, Tom Robertson. Two teams had been added to the 1st division, the total of 18 teams meaning 34 league games in a season instead of 30. 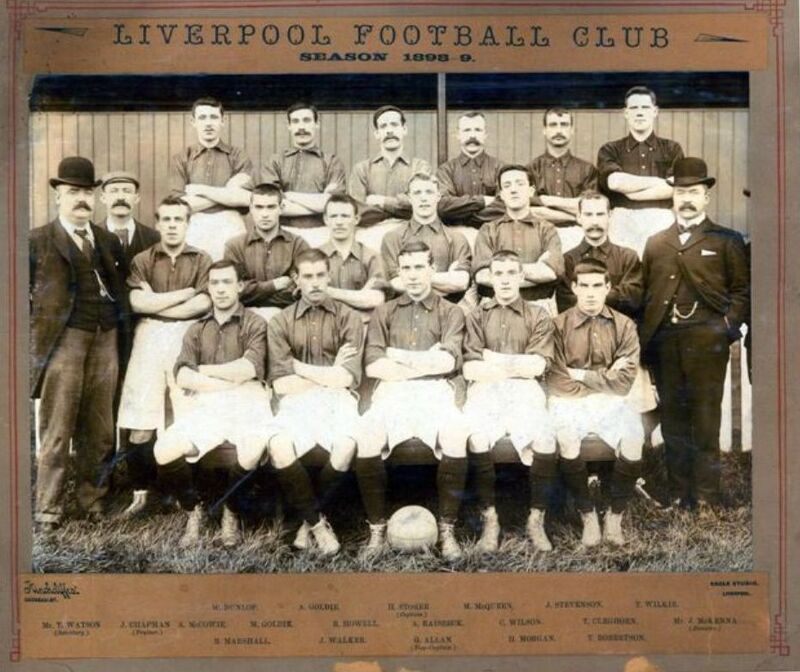 Liverpool started the 1898-1899 season with a convincing 4-0 win over The Wednesday. Liverpool beat Everton 2-1 at Goodison Park but the Reds failed to use their first victory on Everton’s ground to further glory and lost 3 out of 4 following games. The same inconsistency as in the previous season was in evidence until late December. From 31st of December until 4th of February Liverpool scored 10 goals without a reply in 5 wins in 7 games, among them a 2-0 win over Everton at Anfield, doing the double over their neighbours for the first time. Liverpool were finally a championship contender under Tom Watson. Morgan put the Reds 1-0 up after five minutes of play. The highlight of the game was undoubtedly Alex Raisbeck’s first goal for Liverpool. This future Reds superstar “had a long drive, and scored with a beautiful shot.” Higgins headed the ball in his own net for Liverpool’s third before Newcastle managed to squeeze one in, 3-1 the final score. Liverpool were drawn away in the quarter-finals vs one more 1st division side, WBA, but goals from Morgan and Robertson brushed them away. Come March Liverpool were in the semi-finals of the cup as well as battling for the title, their last defeat had been on 10th of December. 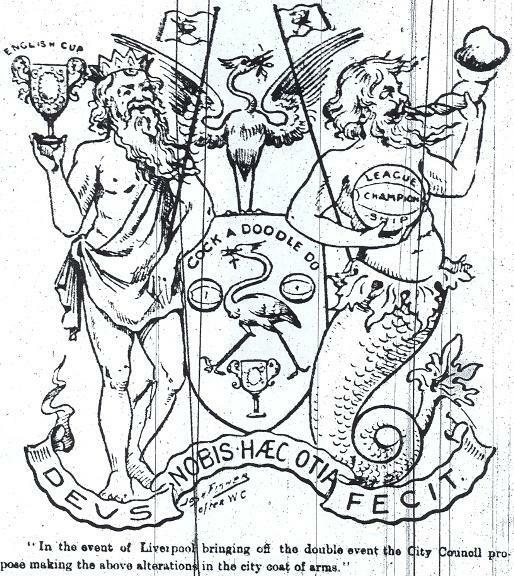 making the above alterations in the city coat of arms." After being defeated four times in the semi-finals of the FA Cup Tom Watson was hoping his time had finally come. A momentous duel with Sheff Utd awaited Liverpool in the FA Cup Semi-final. 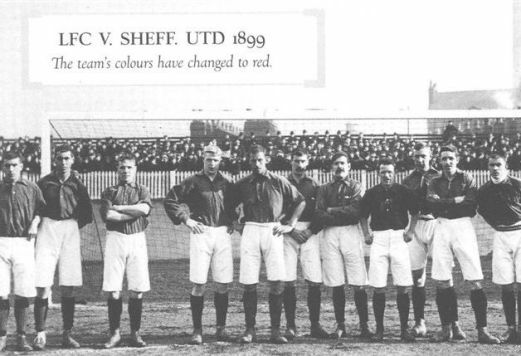 The teams drew 2-2 at City ground in their first game. 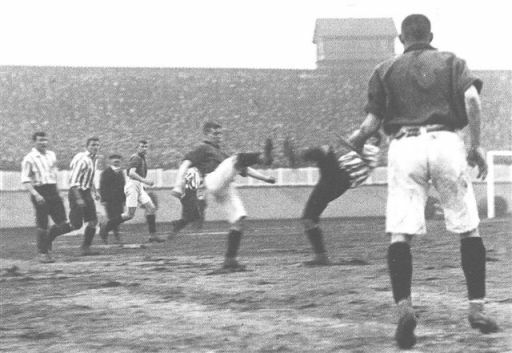 The replay at Burnden park five days later was an amazing affair; a 4-4 draw in which Liverpool twice threw away a two goal lead. The Liverpool Football Echo staff was clearly frustrated at Liverpool's failure to reach the final at Crystal Palace: "After the trials and tribulations of the last days, notably one day at Nottingham and one day at Bolton, I have reason to thank heaven that I am a philosopher. That fact alone has enabled me to overcome the bitter disappointment of the two fiascos to which the vague allusion has just been made. I use the word fiasco advisedly. Anybody who cares to use a stronger and more highly coloured expression is quite at liberty to do so. The ugly fact remains that the Liverpool team has thrown away two splendid chances of going to the Crystal Palace, and if at the third venture they get hopelessly whacked, they needn't look for sympathy in this city." wondering about Liverpool's fate in the cup. 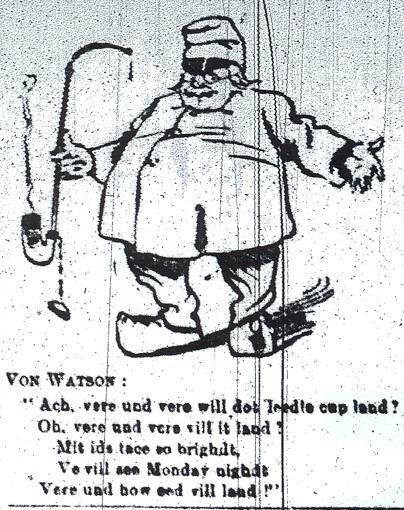 "Ach, vere und vere will dot leedle cup land? Oh, vere und vere vill it land? Vere und how sed vill land!" Liverpool (To Sheffield) - Bah! We'll fight to the finish at Manchester on Monday! 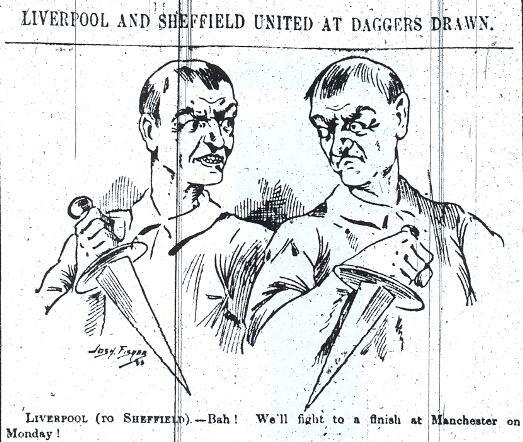 Sheffield United and Liverpool battle it out. Reds lost after three and a half matches! Liverpool now focused only on the league where six games were left in April. 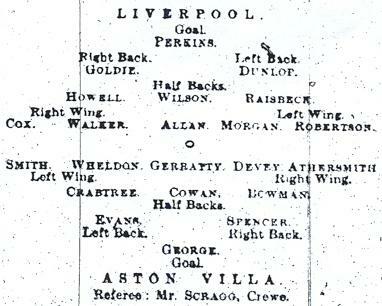 Liverpool went 1-0 up vs. Bolton at Burnden Park in the first minute through Morgan but lost 1-2. Liverpool conceded two goals vs. Newcastle in the next game, but scored three. Liverpool won the next three games which were all at Anfield scoring seven goals without conceding any. 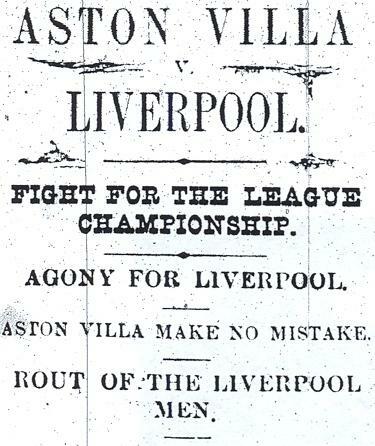 Fate had it that Liverpool faced their main championship rivals, Aston Villa, at Villa Park in the final round. Both teams had 43 points, but only a win would do Liverpool as Villa had a slightly better goal average of 1,775 (71 scored / 40 conceded) vs. 1,75 (49/28). Liverpool Football Echo reported on the most important game in Liverpool's history: "For some weeks past Liverpool and Aston Villa have been running a neck and neck race for the coveted position, and today's encounter was watched with almost painful anxiety and interest. Neither club spared time or money in preparing for the fray, and both elevens turned out in the peak of condition. The Anfielders had been away all week at St Anne's, where they underwent strict training, while the Midlanders selected Holt Fleet for their health resort." The line-ups for the all important championship fight! Liverpool lost the toss and pretty much lost everything after that. Garrity put Villa 1-0 up after only four minutes and another went in for Villa when just under twenty minutes had passed and it was a total nightmare for the Reds. The half-time score was not to be believed, the Liverpool team that hadn't conceded for three games running were 5-0 down which turned out to be the final score. During the interval a band played "Au Revoir" to Villa supporters' amusement. Liverpool could just as well say goodbye to the League Championship. No further goals were scored in the second half and Liverpool's title dream had collapsed. Liverpool had never been closer to the title and would have to wait a couple of years before their mission was accomplished. 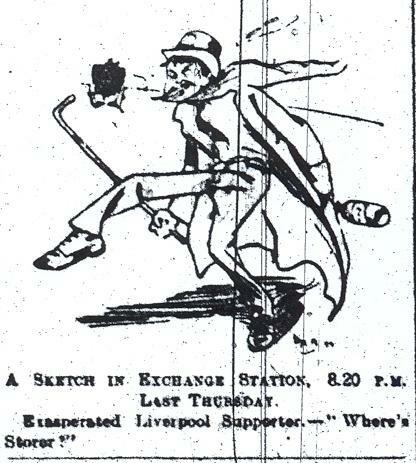 Copyright - Arnie at LFChistory.net ([email protected]) - researched from Liverpool Mercury and Liverpool Echo. NEXT: Liverpool going from 10th to Champions in one year - the first League championship in the club's history.